The Universal Security Instruments MIC3510SB 3-in-1 Smoke, Fire and Carbon Monoxide Smart Alarm provides 10 years of continuous protection against deadly threats in the home. New patented Universal Smoke Sensing Technology provides the benefits of both photoelectric and ionization alarms in one device to protect against fast flaming and slow smoldering fires. 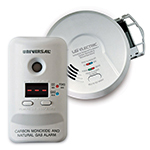 This smart alarm also offers protection against the silent killer - carbon monoxide - making it a 3-in-1 detector. The ideal addition for new or replacement installations, this maintenance-free alarm is suitable for houses, apartments and mobile homes in every room. This 3-in-1 smart alarm utilizes a sealed battery (included) that will never have to be replaced throughout the life of the detector, giving you a decade's worth in peace of mind even in the event of a power outage. Permanent Power also saves money from battery replacements (up to $38.00 over the 10-year life of the alarm), eliminates annoying low battery chirps and helps the environment by reducing environmental waste from disposed batteries. This alarm features microprocessor intelligence to completely eliminate nuisance alarms, a single silence/test button to quiet a non-hazardous alarm and an end-of-service life warning that sounds when it's time to replace the alarm (approximately 10-years from activation). This USI Combination Alarm conforms to UL217 and UL2034 standards. It is also California State Fire Marshal approved and Federal Housing Authority (FHA) approved to exceed industry standards. 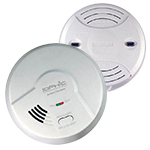 The Universal Security Instruments MIC3510SB 3-in-1 Smoke, Fire and Carbon Monoxide Smart Alarm comes with a 10-year limited warranty that covers both the alarm and battery. Easy to install. Received on time. We have these detectors all throughout our home and we feel safe with them. 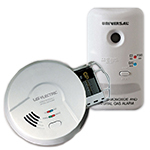 I ordered the USI Three In One Smoke Detector from Universal Security Instruments, Inc. and am very happy with it. It was a good price. The Shipping was quick and the package was undamaged. I will order from this Company again and will highly recommend them to my friends. Installed in the basement as they had no protection down there. Very easy to install. Again I hope the battery will last the 10 years. I've had these alarms installed for 3 to 4 months so far and am totally satisfied. I searched for some time for combined smoke/fire/CO detection and this was one of the most attractive and manageable options. Easy to install and the 10 year life is just what I needed to set it and forget it. I have one on each floor as well as one adjoining the kitchen. I knew the kitchen was a stress case for false alarms, but have been pleased to have none. The one alarm we got on that one was definitely in a smoke filled room. The free delivery was super fast and the units were very ez to install. Easy installation. Did the whole house in minutes. No issues on installing and no false alarms, Seems a good value for a tri function alarm and complies with California codes. Purchased the 3-1 detector for our 50 boat. Like the fact that I wont have to change the battery. So far, it is working great. We are very happy with this product and are re-ordering additional units. Shipment received timely. Detectors easily installed. Everything as advertised. Simple to order, alarms came in timely fashion, price was reasonable. What more could you want? This 3-in-1 alarm smoke, fire, CO seems to be as advertised. I like that it has a smart sensor to detect both smoke and fire. I also like that the unit is sealed and has a 10-year service life - no changing of batteries required.